What is IMANI Cultural Academy? The IMANI Cultural Academy provides tutorial instruction in the critical educational areas of math, reading, and writing. Our staff is professionally trained and certified, with extensive experience in various educational teaching practices. We focus on building our children's confidence, skills, and interest in learning. 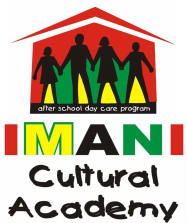 Founded in 1994, IMANI Cultural Academy is the most affordable afterschool program in our community that doesn’t slack a bit on quality. Extracurricular activities include: African Dance, Computers, and Drama. Register your children today because the school year will pass by quicker than you think. Achieve - Believe - Conceive (ABC) is an integrated approach that creates more opportunities for children to learn academically, socially and culturally. Today our children must be viewed as well-rounded people and we must be able to meet their needs with an approach to education, which includes character development. Learn more about the Mission of IMANI Cultural Academy by clicking here.